We've just received a heads-up from one of our readers that HTC has made a previously-unseen version of its stylish One M8 flagship available in Saudi Arabia. As you must have gleaned from the title already, the new color option is an oh-so-trendy gold one, dubbed "Precious Gold". Sold exclusively through STC (Saudi Arabia Telecom) for the time being, it remains unknown if HTC is planning on releasing such a version to the wider world, and, quite frankly, the available renders don't really paint a thorough picture of the device. In other words, while we're not big on golden phones, we wouldn't want to call this one unattractive before we see the actual hue in real life. As for the hardware specifications of this particular model -- nothing new is going on here. The specs read the same: a 5-inch, 1080 x 1920 pixel resolution display, a quad-core Snapdragon 801 chip, 2 GB of RAM, and a 4MP "UltraPixel" rear camera. 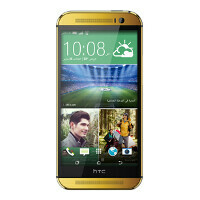 In terms of pricing, without a contract, the HTC One M8 Precious Gold costs the equivalent of about $750 (prepaid SIM). And yes, that's the exact same price tag STC has attached to the standard One M8 color versions, so no premium here. I wouldn't be surprised if this sold well there! That device looks gorgeous in that finish! Ofcourse it will cause the Arabs there are filthy rich. Unfortunately it is the minority elite that are filthy rich. Most ordinary arabs are very poor and non arabs that were born or live there are even worse off, thanks to rampant racism. STC is Saudi Telcom Company. Not saudi Arabia Telcom. It makes sense given the market. Especially since Saudi Arabia is buying up a large portion of the new gold from mines. Only makes sense to make what people will buy. I still don't get the whole issue of materials used. Most phones I see have cases on them, so who cares about what you can't see? I have never seen a metal case in person. Being sold in my home country.